THE LODGE Is A Meticulously Crafted Mountain Retreat, Located In BEAR PAW RESORT, With Lots Of Activities For Your Family To Enjoy And Long Range Mountain Views! Upon Entering You’ll Appreciate The Soaring Ceilings, Handcrafted Stacked Stone Fireplace And Hardwood Floors, But The Large Windows ... They Invite You Outside Where You Can’t Help But Enjoy The Long Range Mountain View ... And Relax. MAIN LEVEL: After A Busy Day, You Can Relax In The Great Room, Dining Area, Kitchen. French Doors Lead Out To The Porch, Which Spans The Full Length Of The House. There’s Lots Of Rockers, A BBQ Area, And You Can Dine Al fresco On The Porch And Enjoy The Gorgeous Summer Weather With Family And Friends. Back Inside, The Master Suite And Guest Bath Are On This Level. UPPER LEVEL: The Loft Overlooks The Great Room, With A Sitting Area And A Queen Sleeper Sofa. There’s Another Comfortable Bedroom And Bath Here. LOWER LEVEL: The Game Room Is Perfect For Ping Pong, A Movie, Or A Board Game. The Third Bedroom And Bathroom Are Here, And When You Need It, The Laundry Room. The Game Room Leads Out To Another Porch, With A Swing When You Want To Just Get Away. 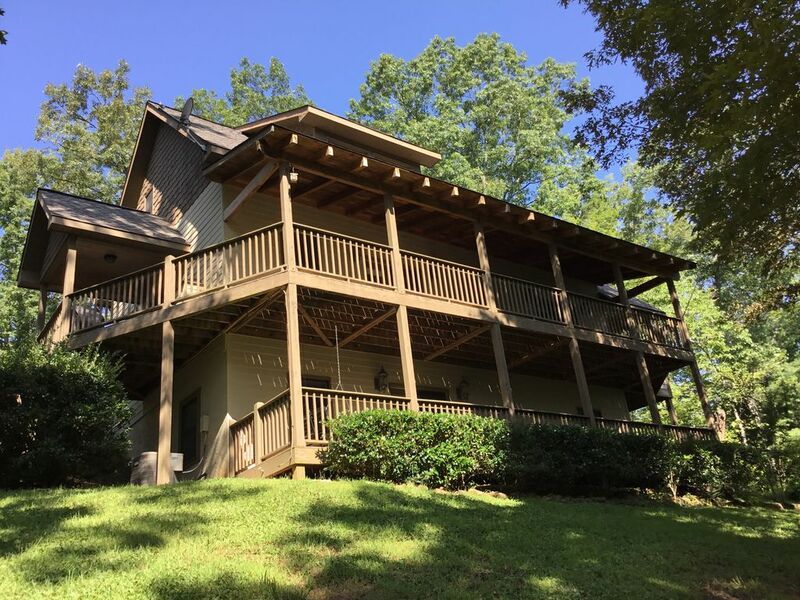 There’s Relaxing Long Range MOUNTAIN VIEWS From All Three Levels Of The Home,... And LAKE VIEWS From The Upstairs Bedroom And Porches. The Design Includes Three Spacious Master Bedrooms... One On Each Level For Privacy. MAIN LEVEL BEDROOM & ENSUITE : There’s A Queen Antique Poster Bed, Walk In Closet And Spa Like Ensuite With A Soaker Jetted Tub (Perfect After A Hike). This Room Has A Private Porch ... With LONG RANGE MOUNTAIN VIEWS ... The Perfect Place To Enjoy Your Morning Coffee. UPPER LEVEL BEDROOM: This Bedroom Has The Best VIEW OF LAKE HIWASSEE. There’s A Queen Sleigh Bed, Sitting Area And Full Bathroom. The Loft Has A Comfy Sleeper Sofa. LOWER LEVEL BEDROOM: There’s Two Twin Beds, A Walk In Closet And Full Bathroom, Next To The Gameroom And Porch. The Country Kitchen Has Custom Oak Cabinetry, Stone Countertops And An Island Where You Can Pull Up A Stool And Enjoy A Beverage While The Meal Is Being Prepared. It’s Fully Stocked With A Coffee Maker, Toaster, Crockpot, Pots And Pans, Beautiful Dishes, Serving Ware, And Spices. Aren’t Most Of Us Looking For That Special Place Where We Can Make Family Memories? ... Birthdays, Holidays, Anniversaries And Vacations ... These Occasions Make Us Realize That Time Together Is Priceless. The Great Room Is Perfect For Families Sharing Stories About Their Day, Watching Movies Or Playing Board Games. Downstairs Is A Second Living Area/Game Room, With Games, TV And Ping Pong. We All Enjoy Being Together But We Sometimes Need Alone Time. Upstairs In The Loft Is A Favorite, But The Swing Downstairs On The Porch Is A Great Place To Snuggle Up With Some Blankets And Pillows And Take A Nap Or Read A Good Book. There Are Plenty Of Places To Just Get Away And Relax. We’ve Furnished This Home To Be The Place We Always Looked For When We Travelled ... With Comfortable Mountain Furnishings And Accessories By Local Artisans. It’s Our Vacation Home And Not A Rental Cottage Or Cabin. We Enjoy Sharing It With Those Who Enjoy The Outdoors And Family Time. There’s LAKE HIWASSEE With A Full Service MARINA, That Rents Boats, Kayaks etc., And Fishing On The Lake Is Spectacular. Bear Paw Resort Also Has An Olympic Size Swimming POOL, TENNIS COURT, PLAYGROUND, Children’s FISHING POND (So Fun), HIKING in And Around Bear Paw And Paved Roads For Easy Access And Walking. There’s Also Summer Musical Events, July 4th Fireworks On The Lake And A Golf Cart Parade (That Passes Right By Our Home). Whitewater Rafting, Zip Lining And The Great Smoky Mountains National Park Are Just 45 Min. Away. Hiking, Waterfalls, Golf, AntIquing... It’s All Here. There’s Some Top Notch Restaurants Too. The Copper Door And Brasstown Restaurant Are Worth The Drive. For Casual Dining, There’s The Chop House, Shoebooties, (Funny Name ... Great Food), The Daily Grind ... And For Ice Cream , The Sweet Tooth. The Lodge Is Located In The Lovely Gated Community Of Bear Paw Resort, In The Mountains Of Southwestern North Carolina ... Near Murphy, North Carolina, And Blue Ridge Georgia, And An Easy Two Hour Drive From Atlanta, Chattanooga, Knoxville Or Asheville. It’s Tucked In Amongst The Oaks And Maples For Privacy, The Lake, Pool etc. Are Just Three Minutes Down The Road. There’s Easy Access On Level Paved Roads And Ample Room For Parking For Two Vehicles ... No Boat Trailers. (Please Make Prior Arrangements With The Marina For Boats And Boat Trailers). We’re Centrally Located, Perfect For Day Trips. MARINA: Bring Your Boat Or Rent One From The Marina In Bear Paw Resort. POOL: The Olympic Size POOL is Open Mem. Day - Labor Day. TENNIS COURT: We Provide Tennis Rackets For Your Use. BEAR PAW LIVE: MUSICAL EVENTS Scheduled July 6 (Baby Grey), Aug. 10 (Sinatra & Friends Music), Aug. 31 (120 East Band) ... Great Concerts Planned! HIWASSEE DAM: Is Just Across The Street From Bear Paw (Literally). It’s A Nice Walk ( Or Drive) With A Great Picnic Area. WHITEWATER RAFTING & KAYAKING: Fun And Safe Guides Will Ensure A Great Trip With All The Equipment Provided. 45 Min Away. ZIP LINING: 45 Min. Away. BALD RIVER FALLS: Beautiful Falls. You Can See It From The Road, Or Take A Walk Up The Falls. 1 Hr Away. TELLICO GRAINS: This Bakery Is A Real Treat After A Hike Up Bald River Falls. BILTMORE ESTATE: You’ll Need A Full Day To See It All. 2 Hrs Away. BLUE RIDGE GEORGIA: Lots Of Quaint Shops & Eateries 35 Min. Away. GOLF: OLD UNION GOLF COURSE ... When You Are Ready For Golf. 25 Min. Away. THE COPPER DOOR RESTAURANT: This Restaurant Is Exceptional. 1 Hr Away. BRASSTOWN RESTAURANT: The Sunday Brunch Is One Of Our Favorites. Everything Is Homemade. 45 Min. Away. We Provide Information & Directions To These And Other Fun Activities, Along With Grocery Stores In Our Information Booklet When You Arrive. There’s So Much To Do ... Or You Can Just Relax. So What’s So Great About The Lodge And Bear Paw Resort? When He Wants Hiking ... Fishing ... Boating And She Wants A Pool ... Tennis ... And A Spectacular Modern Resort Home And You Both Want To Get Away To The Mountains And Relax ... THIS IS IT! Luxurious Mountain Home .. Inside Bear Paw Resort With Lake & Marina .. Olympic Size Pool .. Tennis etc. Bear Paw Resort Is Surrounded On Three Sides By Lake Hiwassee. Great View Of Lake Hiwassee From Upstairs Master Bedroom And Porches. Relaxing Mountain Views .. 3 Mountain Ranges. Feel Free To Relax & Read. Just breathtaking views and perfect accommodations. Such a sweet little house in the mountains. Incredibly clean and accommodating. Owners really easy to work with and quick to respond. We had the BEST time. Loved playing on the Lake. Also ... only 45 minutes away to white water rafting and great hikes. If you come ... consider renting s boat for a few days. The Lake is key. We fortunately had friends on the mountain and we boated with them. The Lake makes Bear Paw. The Marina Rents boats. :) a must come and experience vacation. It was a really great place to take a family to just get away. There is plenty to do within a couple hours of the cabin and the cabin was wonderful. I would like to go back in the winter of fall to see the view through the trees without the leaves, I believe it would be breathe taking! So happy that y'all had fun. We really do try to make it so that guests have the perfect family holiday whether it's a family vacation to spend time together or a romantic getaway. We had a terrific time. Mom and Dad spent a lot of time on the swing talking and laughing. We enjoyed the pool. Our whole family was able to spend lots of time together in the evening, and yet since the home is roomy, with TV’s and WiFi everywhere, we did not get in each others way. The views were breathtaking, unlike anything we have seen before. Thank you for sharing your vacation home with us. We came with another couple and were shocked when we walked in the front door. This place is amazing. It's even better than described on vrbo. We brought our boat and spent our days on the lake and our evenings on the porch. We enjoyed ourselves so much that we forgot about our jobs and had a great time. There's something about this place that is so relaxing. We are already trying to arrange our schedules so we can return next year. One word describes our weekend, perfect! This home was better than we anticipated and the views were amazing. It was such a serene place to spend time together and reconnect. We really enjoyed our Valentines Day weekend .